Deluxe Rooms are well spaced out and comfortable with personalized services to make our guests feel at home. We have 11 deluxe rooms, with all the modern amenities. Bathrooms have hot & cold running water. Special Rates for wash & change facility only for corporate executives. AC Twin Sharing Deluxe Room With Attached Bathroom PG For Girls. AC Twin Sharing Deluxe Room With Attached Bathroom, Free WiFi, Cupboard, Study Table, Books Cabinet, Automatic Washing Machine. Designed for the lovers of nature, The Green Room encapsulates power of nature in a botanical theme. This room is swathed in green, brown and black earthy tones, covered with antique pieces and detailed artworks to provide elegant atmosphere. 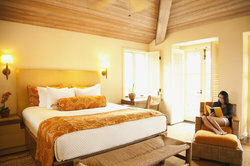 River side Deluxe Rooms are located in mango – orchard where complete privacy is maintained. Cottages are luxurious appointed and its décor is wooden and rustic finish which giving you a feel of Rajasthan. And it has a private sitting space. The Super Deluxe Rooms offer spacious and attractive accommodation for your stay in Jaipur! Fully stocked with all the amenities the modern traveller expects, these rooms are guaranteed to offer a rewarding and restful experience during your time Hotel Jai Maa Palace, Jaipur. Our Deluxe Rooms are extra large and come with 280 sq. ft. of space. They provide you with all the space you need to make your stay comfortable. Description : Luxury Room ac accommodation at our hotel is best for travelers like Back Packers, Tourist, Honeymoon Couples, Business Travelers, Senior Citizen and for Day Use. Our luxury room feature like Wi-If Internet, Tea-Coffee Maker, LED/LCD TV, Refrigerator, Mini-Bar, Hospitality Kit, Daily Housekeeping and more. We offer our guests best hospitality services while accessing our deluxe room services. Splendid décor and soothing ambiance of our furnished rooms define our generous sense of comfort and luxury that we offer to our visitors while staying at our hotel. Boasting an outdoor pool, ITC Gardenia is situated in Bangalore and offers luxury accommodation. It is close to UB City, eateries and shops. Our Deluxe rooms are neatly laid out for with all major amenities like LCD TV, Fridge, AC, Hot & Cold Water and much more for your utmost comfort. Simple, soothing and restful design with art work on the wall, a room with great value to your budget. - Bathroom fitted with Hand shower and 24-hrs running Hot and Cold water.